FORT CAMPBELL, Ky. -- Some 57 active duty service members killed themselves in the first quarter of this year, according to a report released by the Defense Suicide Prevention Office. These numbers increase when adding Reserve, National Guard and veteran statistics. National Suicide Prevention Awareness Month is observed each September, and Fort Campbell is marking the occasion by hosting events to educate the community. 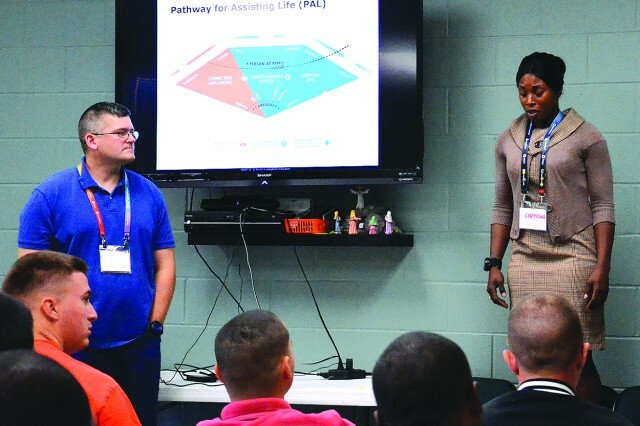 "The big picture is just to get our community better educated on identifying what stress looks like and then being empowered and encouraged to engage when they see that stress," said Fort Campbell Suicide Prevention Manager Joe Varney. Special training and guest speakers began the monthlong observance. These events ran in conjunction with Suicide PT, a physical activity where chaplains or behavioral health specialists lead Soldiers through activities while carrying sandbags. "The sandbags represent the burdens that Soldiers carry," Varney said. "Then at each stop when they're getting a new sandbag, they get a little briefing about causes, effects, warning signs of suicide." Suicide PT is in addition to Applied Suicide Intervention Skills Training, which is ongoing throughout the year and provides the Fort Campbell community in-depth training about what to watch for in Soldiers and others that might signal suicidal thoughts, and then how to engage with these individuals. 101st Airborne Division Sustainment Brigade Soldiers participated in the training, Wednesday, by responding to a fictional scenario where a woman threatened to jump off a bridge. "This training is really good, and it gives people a structure to notice the signs. To recognize the signs and to be able to maybe talk them off that ledge," said Staff Sgt. Karl Erickson, 218th Military Police Company, 716th Military Police Battalion. "Not everybody's going to be on a bridge of course, but they're on a ledge, nonetheless." Erickson attended the mandated training with several other MPs, and he said it gives Soldiers a structured way to approach those displaying signs of suicide. "It's our job, not just as MPs, but as leaders in the military to notice those signs because we need to identify those high-risk Soldiers to where they know that us as leaders care about them," he said. Suicide is an epidemic not isolated to Soldiers, but one Varney said can be found throughout history and in multiple cultures -- ranging from Greek mythology to Egyptian hieroglyphics and even the Bible. Signs someone is suicidal often stem from everyday events and stressors, which is why Family members, friends and coworkers are so essential in prevention efforts. "Every suicide is unique upon itself, and the stressors that are applied to that individual that causes them to feel that they have no way out other than suicide are also as unique," Varney said. "The biggest, most predominant stress trigger for our Soldiers today is a failing relationship." Relationships played a major factor in four of the five active duty suicides at Fort Campbell this year, Varney said. Financial struggles, legal issues and career changes or challenges up the likelihood of suicide, along with "anything that is a significant change in an individual's personal life," Varney said. New Army research also points to difficulty sleeping and enduring pain as two major stress triggers for suicide. The best thing people can do for those who might be having suicidal thoughts is ask them about it, as uncomfortable as that process might be, Varney said. "If you witness a battle buddy, a coworker, a neighbor, a Family member that's having relationship problems, having money problems, having legal issues, having difficulty sleeping or has some ongoing medical issue, you need to pay attention," Varney said. "If you see that their behavior changes or if you see that their attitude or demeanor changes, you have to be courageous enough to stick your nose into their business and ask them [about it]." Sometimes simply interacting with a person who is struggling and asking them about what is bothering them can make a world of difference, Varney said. "The simple act of allowing somebody to articulate their pain lowers their stress and allows them to live another day," he said. If you are having suicidal thoughts or know someone that is, call the National Suicide Prevention Lifeline at 1-800-273-TALK. Press 1 for the Military Crisis Line. Varney encourages the Fort Campbell community to take advantage of the resources available. "Just because things look at their worst, their darkest today doesn't mean that it's always going to be bad," he said. "It's not always going to be dark. Help is available. If you allow yourself to share your pain with somebody, it helps. It's healing. Death is not the only choice. It may seem like it, but it's not."